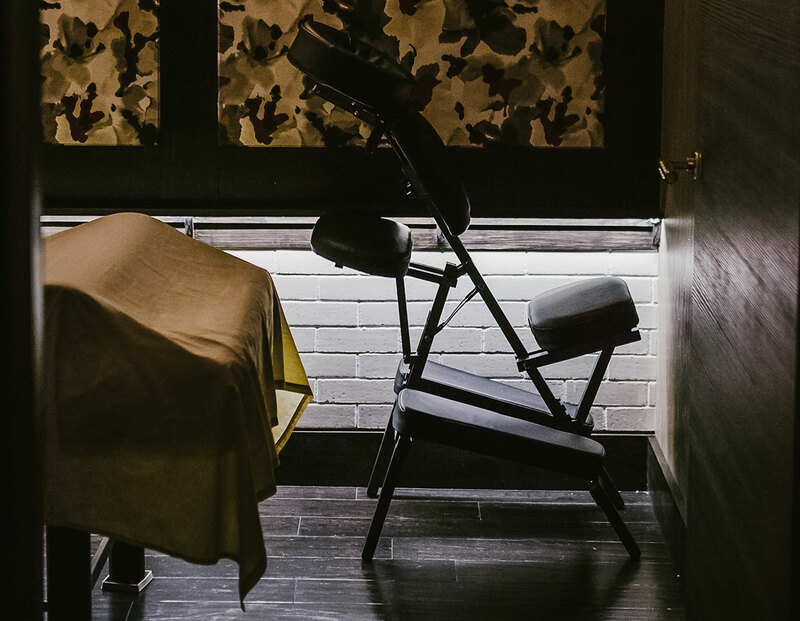 Our luxurious Buckhead spa offers chair massages. Unlike our other body massages, you are fully clothed during a chair massage. A chair massage is a style of massage that uses similar techniques to our traditional massages but is performed with the recipient in a seated position. Treat Your Feet has special chairs with cradles that allow you to fully relax face down with your arms supported by armrests so that your back, neck, shoulders and arms are fully accessible to your therapist. Chair massage techniques include a mixture of Western massage styles such as Swedish and deep tissue and are helpful in relieving muscle tension in the body without all the fuss of a traditional massage. Because of the distinctive sitting position of the massage chair, our massage therapists have better access to the muscle tissue and can provide deeper pressure to the neck, back, arms, and shoulders compared to a traditional massage. In addition, while massage oils are used for many of our traditional massages, we don’t use them in our chair massages. As mentioned earlier, you are fully clothed during a chair massage which may add a little comfort. For some of our elderly patrons, getting into one of our massage chairs may be easier than getting on to our massage tables. While both chair massages and traditional massages aim to relieve stress, muscle tension and pain, chair massage techniques focus on pressure points located in the back, neck and shoulder areas while traditional massage addresses the entire body. Because the focus is on a smaller portion of the body, a full chair massage can typically be completed in about half the time of a traditional full body massage. Treat Your Feet’s massage therapists are fully trained and experienced in providing relief of stress, tension and pain in just 30 minutes by using established chair massage techniques. All of our body massages are a minimum of 1 hour with the exception of our Swedish and deep tissue massage.